TransylvaniaNOW: What on earth is the Szekler Legendarium? Szabolcs Fazakas: A project started in 2008 that aims to collect and publish the legends of Szeklerland and promote them in the community, throughout the Carpathian Basin and internationally. We believe that these legends are lessons from our past, giving us a strong moral foundation in the present and also offering a path to the future. And I also think they can be interesting for world literature as well. TN: Where did the idea come from? Sz F: Twelve years ago, as Szekler journalists we got invited to the European Parliament. In the Parliament’s visitor’s center, we received a cultural map showing the different legends of the different areas of the EU, and in Transylvania the only legend shown was that of Dracula. It felt wrong, and I wanted to do something about it. I wanted to show the world that our region has much more exciting and older legends. In this small region, almost every historical place, fortress, village and saint has at least one legend, and the area is “populated,” of course, by fairies, elves and demons. You know: Dracula is merely a 120 year-old novel, written by an Irish author in the 1890s. Meanwhile, over the last decade alone, we have already collected more than 1,200 legends that are centuries old. That is only from Szeklerland, and doesn’t even begin to touch the other parts of Transylvania. TN: How are you publishing these legends? 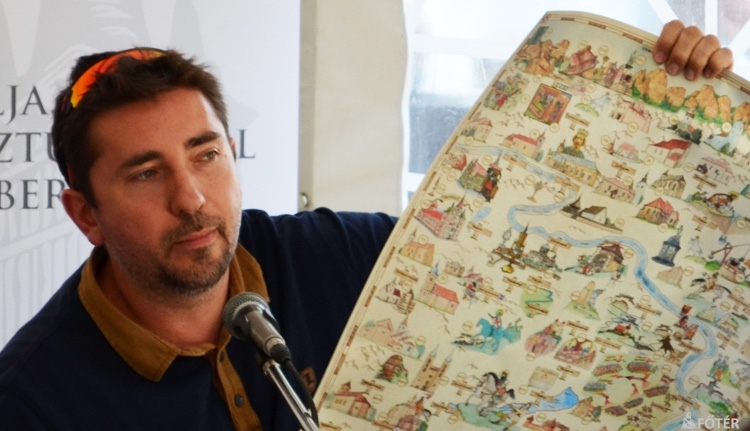 Sz F: Our very first product was a map of Szeklerland, decorated with illustrations of 156 legends related to the region. This was basically a replication of the culture map we received in the European Parliament, but it met with an amazing reception locally. After that, one thing led to another. We first published the legends in a book, then we created audio books, a coloring book and several games. Our next step, in 2012, was to establish the first animation studio in the region, and we started to create cartoons as well. The studio now has 14 artists. TN: What’s in the future? Sz F: We are working on our first animated series, which will be finished next September. When all 13 episodes are done, we would like them to be screened on Cartoon Network and other TV channels around the world. For this purpose we are recording English voice-overs for the episodes in London with actors of Her Majesty’s Theatre (HMT) and we have entered animated film festivals from London to Cannes and California to India, to promote our work. We are also negotiating with producers and broadcasters. Next summer we are going to open our Mini Transylvania Park as well at Szejkefürdő (Băile Seiche), near Székelyudvarhely (Odorheiu Secuiesc), which will be similar to the Mini Europa Park in Brussels. We are going to show visitors the architectural heritage and variety of Transylvania with sixty miniature buildings over a one-hectare (2.5 acre) area.